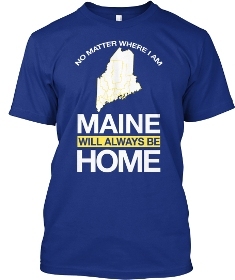 Will you always call Maine home, no matter where you are? Then you gotta get this new shirt!! Normally $29.95, but since you love Wyoming, you can get it today for just $19.95 and have yourself a collectors item! NOT IN STORES and this limited-edition offer is CLOSING SOON! Order yours now to avoid disappointment. Select your color Tee, V-neck or Hoodie and click on BUY NOW to choose your size. Here’s a link to order.